Emperor Go-Nara (後奈良天皇 Go-Nara-tennō) (January 26, 1495 – September 27, 1557) was the 105th Emperor of Japan, according to the traditional order of succession. He reigned from June 9, 1526 until his death in 1557, during the Sengoku period. His personal name was Tomohito (知仁). Daiei 6, in the 4th month (June 9, 1526): Go-Nara was proclaimed emperor upon the death of his father, Emperor Go-Kashiwabara. He began his reign at age 31. Daiei 6, 7th month (1526): An army from Awa Province marched towards Miyako. Hosokawa Takakuni attacked these forces at the Katsura River, but his forces were unsuccessful. Hosokawa Takakage came to the aid of Takakuni, and their combined forces were successful in stopping the advancing army. Daiei 6, 12th month (1526): Shōgun Ashikaga Yoshiharu invited archers from neighboring provinces to come to the capital for an archery contest. Kyōroku gannen or Kyōroku 1 (1528): Former Kampuku Konoe Tanye became Sadaijin. The former Nadaijin Minamoto-no Mitsukoto became Udaijin. Former Dainagon Kiusho Tanemitsu became Nadaijin. Tenbun 5, 26th day of 2nd month (1536): Go-Nara was formally installed as emperor. The Imperial Court was so impoverished, that a nationwide appeal for contributions went out. Contributions from the Hōjō clan, the Ōuchi clan, the Imagawa clan, and other great daimyō clans of the Sengoku period allowed the Emperor to carry out the formal coronation ceremonies ten years later. The Imperial Court's poverty was so extreme that the Emperor was forced to sell his calligraphy. Tenbun 11, 25th day of the 8th month (1543): Portuguese ship drifts ashore at Tanegashima, and European guns are introduced into Japan. Tenbun 20, 8th to 9th month (1551): Courtiers in preparation to move the emperor from war-torn Kyoto to the Ōuchi city of Yamaguchi were caught in the Tainei-ji incident, a coup within the Ōuchi clan. The massacre of the courtiers in Yamaguchi resulted in a widespread loss of court records along with knowledge of court rituals and imperial calendar-making. The emperor remained in Kyoto. 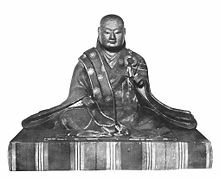 Kōji 3, 5th day of 9th month (1557): Emperor Go-Nara died at age 62. He was unburied for 70 days. Go-Nara is enshrined with other emperors at the imperial tomb called Fukakusa no kita no misasagi (深草北陵) in Fushimi-ku, Kyoto. The years of Go-Nara's reign are more specifically identified by more than one era name or nengō. ^ Titsingh, Isaac. (1834). Annales des empereurs du japon, pp. 372–382. ^ Titsingh, p. 372; Varley, H. Paul. (1980). Jinnō Shōtōki, p. 44; n.b., a distinct act of senso is unrecognized prior to Emperor Tenji; and all sovereigns except Jitō, Yōzei, Go-Toba, and Fushimi have senso and sokui in the same year until the reign of Emperor Go-Murakami. ^ a b c Titsingh, p. 373. ^ Conlan, Thomas (2015). "The Failed Attempt to Move the Emperor to Yamaguchi and the Fall of the Ōuchi". Japanese Studies. 35 (2): 193. doi:10.1080/10371397.2015.1077679. Retrieved 6 March 2016. ^ Citation based on 近衛前久, retrieved from the Japanese Wikipedia on July 14, 2007. This page was last edited on 11 December 2018, at 07:05 (UTC).